Though a member of the family Pinaceae, which contains all the evergreen trees we are most familiar with, such as the pines, spruces, firs, and larches, the Baldcypress tree (Taxodium distichum) is actually deciduous in nature. Its “leaves” are actually small lateral twigs a few inches long, with ½ to 1-inch long yellow-green needles that turn brown before they fall in autumn. 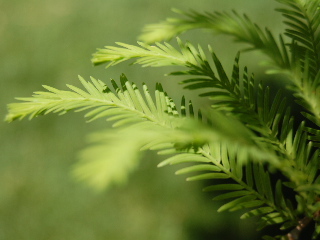 The foliage of the baldcypress tree is similar in appearance to the greenery of the densiformis yews, which are often used for home landscaping purposes. And the baldcypress itself, though not often seen in the home landscape, makes an attractive and unusual specimen tree if planted properly and given enough room to grow. 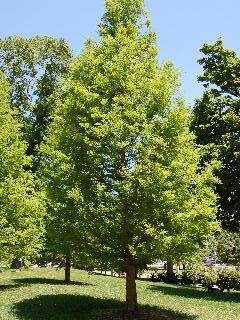 The trees make great showpieces and are often planted in open parkland areas, especially in the southern U.S. The young tree has a narrowly tapered pyramidal shape, very symmetrical in nature. As the tree grows and ages, it tends to “flatten out” somewhat and extend its lateral branches outward more. The baldcypress tree can reach heights in excess of 120 feet, with the largest part of the trunk becoming 3 to 5 feet in diameter. In its natural environment, which is within low-lying wetlands and swamps in the southeastern United States, the baldcypress tree may exceed 150 feet in height and, if left unharmed, may actually reach 1,000 years and more in age! It is in these wet areas that the larger and older-growing trees produce their peculiar conical structures known as “knees”, which arise from the shallow, wide-spreading root system and grow upward 6 to 8 feet with much the same appearance as stalagmites in caves and rock formations. The wood of the baldcypress tree is commercially important, being hard and strong. It is used in building construction and for shingles and siding and, occasionally, in furniture building, its somewhat darkish yellow lumber producing an attractive and unusual finish. The wood itself has a somewhat oily feel and this texture, in addition to its natural hardness, once made it a common building material for industrial water-holding tanks back in the days when such structures were constructed from wood rather than metal. As for its place in the gardening and landscaping arena, the baldcypress tree is in a class all by itself. The bark of the baldcypress tree is somewhat thin and scaly, but with an attractive reddish-brown to ashen-gray coloring. This bark coloration, along with the soft green “yew-like” appearance of the foliage, make the baldcypress tree a bold and unusual addition to your home landscape. If you are lucky enough to find one at your local garden center, bring it home and plant it in a prominent place!